It is a special product which powers-up the average user with its tools to perform operations which may not be easy even for the highly technical person. You may now perform the operations on your Vista/XP machine which were not possible simply by using the Windows interface. This product optimizes Windows performance in depth and enhances the overall system security. It is specially developed for Vista users to make Vista experience a pleasure. ...... You dona�?t have to be a techno-geek to use Advanced Vista Optimizer 2009. All you have to do is download it and you have immediate access to over 40 tools designed to fine-tune and optimize Vistaa�?s settings to match your PC and the software you depend on for work and play. Ita�?s nearly automatic. 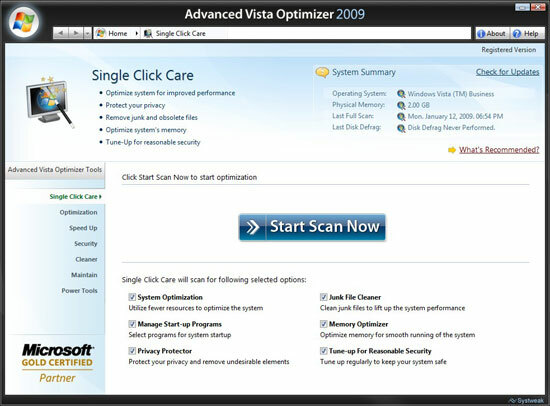 * Single Click Care - This module of Advanced Vista Optimizer is designed for all users to make the most out of their Windows Vista PC without any effort. It includes important tools to optimize system, startup programs, protect your privacy, clean junk files, optimize memory and tuneup your computer for reasonable security. Qweas is providing links to Advanced Vista Optimizer 2009 1.00 as a courtesy, and makes no representations regarding Advanced Vista Optimizer 2009 or any other applications or any information related thereto. Any questions, complaints or claims regarding this application Advanced Vista Optimizer 2009 1.00 must be directed to the appropriate software vendor. You may click the publisher link of Advanced Vista Optimizer 2009 on the top of this page to get more details about the vendor.